U.S. President Donald is threatening to close the border between the United States and Mexico. He has accused the countries in Central America (El Salvador, Guatemala and Honduras) of “deliberately” sending people through Mexico into the United States, and he has accused Mexico of “doing nothing about it.” This of course does not jive with the facts. The Mexican government has tried to slow down the number of Central American refugees who have gone through Mexico to get to the United States, and the Mexican government is working with the U.S. government in trying to keep those Central American refugees who have asked for asylum in the United States to remain in Mexico until their refugee claims have been processed. One important thing that Americans should remember is that El Salvador, Guatemala and Honduras as well as Mexico have no laws that forbid or restrict people from leaving or going through their countries. If a Mexican, Salvadoran, Guatemalan or Honduran wishes to leave then they can do so (although they do need passports to return if that is their intention). 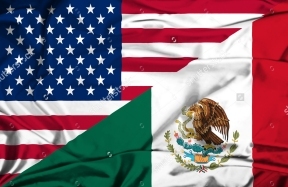 Despite this, the Mexican government is doing the United States a major favor by taking in those Central Americans who have gotten to the United States and are requesting asylum. But Trump’s threat is in fact quite crazy. It goes well beyond the so-called threat to the border. If he implements his threat to close the border, then millions of Mexicans cannot go into the United States to work, and hundreds of thousands of Americans cannot go into Mexico to work. Trade would come to a standstill, and a LOT of food grown and harvested in Mexico could not enter the U.S. market. All of America’s avocados and 40 percent of all of America’s fruits will not be able to come to the United States as they are grown and harvested in Mexico. A good share of America’s automobiles and automobile parts will not be able to enter the United States and this will jack up prices. Tens of thousands of students in Mexico studying in American schools would be stranded. Residents wanting to visit their relatives in either Mexico or the United States will not be able to do so. In the end, Trump will not only violate all trade agreements with Mexico but also federal immigration law and U.S. Congressional laws which will be challenged in U.S. and Mexican courts. Although he has tried to keep a low profile in any political battles in the United States, even Mexican President Andres Manuel Lopez Obrador has condemned Trump on any threats of closing the U.S.-Mexico border. And in the end such a move will NOT stop all the Central American refugees from crossing into the United States—it will only push them from the legal ports of entry to the obscure border lands which cannot be so easily patrolled. So how will the closing of the U.S.-Mexico border make any difference? The only difference it will make is to push the already slowing U.S. economy off a cliff. It could result in an economic recession or a depression. Is this really all worth closing the border? Have we forgotten the economic damage done by the Trump administration in the federal government shutdown last January? In my view, it is probably time to really, REALLY look at the 25th Amendment of the U.S. Constitution.